Sitting in the middle of the chaos, however, is the centerpiece of the exhibit - an interactive room that is decorated in red and blue, with encouragement to "grow the 40." This article is originally published with The Vindicator. 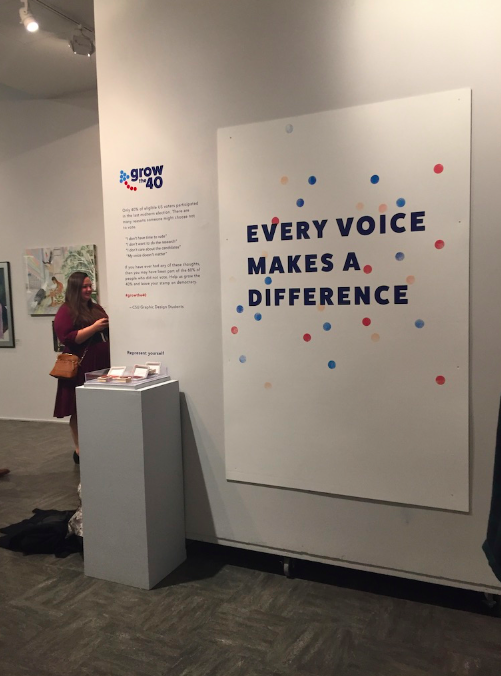 During the spur of voting encouragement in the past several months, the organizers of The Galleries at CSU decided to centralize the new exhibit around this idea. The 23rd People's Art show, which opened on October 26th and runs through December 7th, is eye-opening and chilling. As a long-running tradition at CSU, described on a few large panels at the entrance of the exhibit, the premiere of this gallery was highly anticipated, and brought in many visitors during opening night. With no limitations on medium, subject, size, or artist background, the pieces that were displayed had a wide range. Sitting in the middle of the chaos, however, is the centerpiece of the exhibit — an interactive room that is decorated in red and blue, with encouragement to "grow the 40." Found around the exhibit, and more densely around the decorated room, were descriptions of the students' inspiration for this year's theme. On one of the main walls, the phrase "grow the 40" is explained. It discusses how "only 40% of eligible US voters participated in the last midterm election." The students plead the readers to "help us grow the 40% and leave your stamp on democracy." Similarly, more voter encouragement and political quotes were posted on pillars further into the exhibit, hammering down the designated theme of the evening. Seeing an active public outcry, outside of social media, for more voter participation is thrilling. While at the opening of the exhibit, I made sure to take note of specific works that caught my eye, follow the theme, or that are genuinely fascinating. Many of the pieces that I found interesting vary as widely as the exhibit itself — acrylic painting, sculpture, photography, watercolor, and others. The most eye-catching piece I saw, however, is "Saved by What is Within" by Nico Pico Train. This sculpture, made of clay, acrylic, and natural materials, is disturbing and freeing. "Saved by What is Within" depicts a human with a black bird on its shoulder, a bird's nest as a hat, and branches reaching out from the mouth. It can be seen past the informative voter room, near the back of the exhibit, sitting on a short stand in the middle of the room amongst the rest of the works of art. I remember it was the first thing I saw as I turned the corner, and it made me curious — but I felt a strong urge not to look for too long. After walking the rest of the gallery, I came back to it and noticed a few details that made me want to keep looking for more. "Saved by What is Within" is by far my favorite of the exhibit that I saw. Other than the sculpture by Nico Pico Train, there were a few drawings and paintings that caught my eye as well. For instance, "Space #13" by Mike Rozack and "New Brits" by Mary Guts. Both acrylic, both colorful, and both powerful in different ways. While Rozack's painting reveals a feeling of wonder and a sense of awe of how much space holds, Guts brings the viewer back down to Earth and forces them to see the diversity within our own species. Although in seperate parts of the exhibit, I connected with both of these acrylic paintings and wondered how much time the details really took — because the layering and colors were especially impressive. While there were plenty acrylic paintings to be found, there were almost as many photographs. Two of my favorites were "Fairly Local" by Emma Flynn and "Photograph of a Photographer Photographing a Photographer Photographing a Model (with Reflection)" by Michael D. Okrent. I don't have much to say about the artistic value of Okrent's photograph, because there really isn't much more to be said, but I always love a good title. What I can say, however, is that it was worth the time I spent staring at it and trying to read it correctly. "Fairly Local," on the other hand, attracted me because of the city skyline. Along with the creative inverse of the city above the original, I was pleased to see the Twenty-One Pilots reference in the title as well. There are many more notable photographs that feature various subjects throughout the gallery. In another, usually more simple style, a few artists submitted drawings that do not contain acrylic. I've been drawn to paintings and drawings of body parts especially for the past couple years or more, so "Soul Meet Soul Lovers Lips" by Samantha Bias immediately stood out to me. Unlike the description in the title, this piece doesn't feature lips. Instead, it is a small portrait of an ear with yellow flowers flowing out from it. The work is described as being "watercolor on clay board." On the other hand, in a similar portion of the gallery, there's an interesting political piece by Kevin Collander titled "That Face in the Crowd." Mixing ink and collage, Collander's work highlights individual faces in a crowd of people with no color. By simply glancing at the drawing, it's obvious that Trump's face is the first one the viewer is meant to single out. After spotting Trump, it becomes a game of how many dictators you can spot. Near the back of the exhibit, past the voting room, "That Face in the Crowd" encourages action even more. There are so many more pieces of art that I feel like I missed during the opening of the exhibit on October 26th. Even if I did miss some, or if I want to revisit some of the ones discussed above, the 23rd People's Art Show is open until December 7th. I urge you to take the chance and stop by the gallery downtown before it's over. Details for visiting, like the times the gallery is open and where you can find it, can be found by searching "the Galleries at CSU."